Update: Google pulled the video just a few minutes after the news broke. This makes it seem more likely the device in question is a Nexus. Also, a few more screens from the video have surfaced. Google posted the video of its new KitKat statue being planted on the lawn earlier today, but that's nothing unusual. 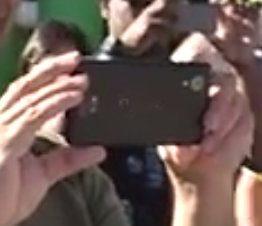 What was incredibly unusual was the device one of the assembled Googlers was using to snap pictures of the event. 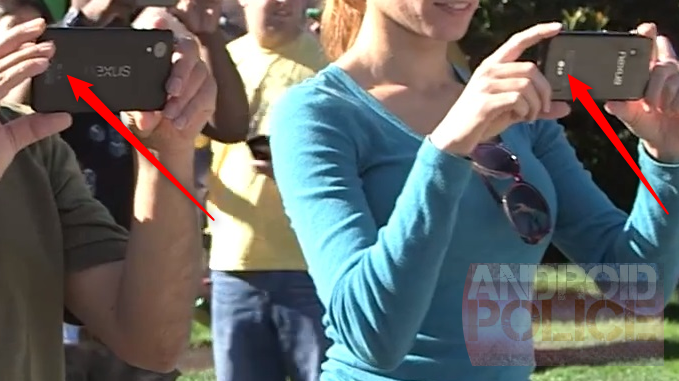 At the 0:38 mark, you can see this fellow holding up a phone sideways, and it has a sideways Nexus logo. It looks exactly like the Nexus 7's new logo, but it's way too small to be the N7. Is this the new Nexus phone? The device has a smooth back and a large offset camera lens. It has an almost Sony vibe, but the branding at the bottom of the device is too blurry to make out for sure. It looks a bit like the LG Nexus 4. The logo lettering isn't discernable, but it has the proportions of the LG "smile." See the comparison above with an N4 conveniently right next to it. The consensus around here is that it's another LG Nexus. It was nice of Google to give us an almost straight on shot of the device with the Nexus 4 in-frame for comparison. I'm not saying it's a plant, but... okay maybe I am.